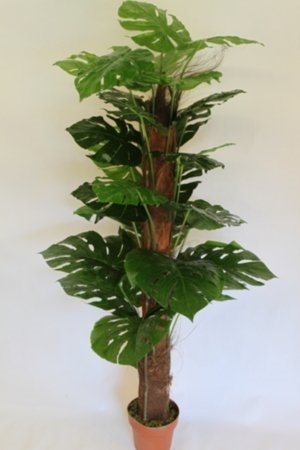 Artificial 1.6m Cheese Plant, comes in a weighted 8″ terracotta coloured pot with artificial moss around the base, so can be displayed as it is or placed into a more decorative pot. Perfect foliage for the home or office or for those who don’t have the time to look after real plants. Ideal for that awkward, dark, draughty spot that most real house plants won’t survive in. This Cheese Plant is made using the finest materials and most advanced manufacturing techniques having wide and dense leaf coverage to ensure a very natural looking appearance. This Cheese Plant has approx 33 leaves.